Views From the Lamb's Herd: Icons! Today, I have been working on getting materials ready for my professional development sessions here at school. I was working on a handout, and I wanted to include icons on the handout. 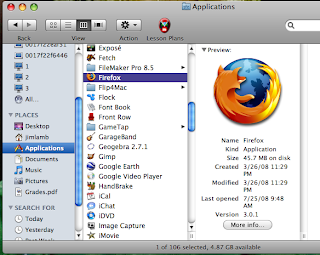 I know I can take a screen shot of just a portion of the screen, but I also remembered that I had learned about how to get various sized icons for any application on my Mac through Preview, but I couldn't remember how, at least at first. But now I remember! I figured, what better way to make sure I remember than to blog it! Not only will I be able to access it later on, but I can also share it with everyone else! So here is a quick tutorial on how to do it! 1. 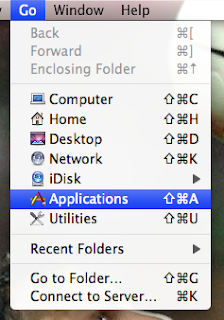 Open your Applications folder. I like to do it through the Go menu, but however you want to do it will work, as well. 2. Choose the application that you want the icon for. 3. 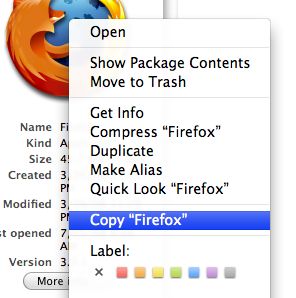 Right-click (or ctrl-click) on the icon and choose Copy "Application" ("Application" is replaced with whatever application you're working with, Firefox in my case). 4. 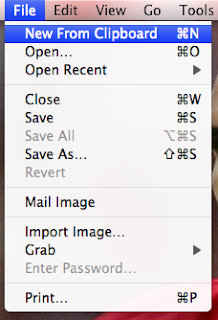 In Preview (open Preview if you already haven't), choose New from Clipboard. Now you have icons that you can work with! You can take these icons and drag them to iPhoto for use with any of your iWork apps. I hope this helps out anyone who was trying to figure out how to do this. Wow! So useful. I'll be using this on in the future.